It's summer vacation season in the northern hemisphere. Travelers are visiting cities across North America, Europe, Central America and Asia. Vacationers are seeking travel to see nature in action while visiting national parks, rain forests and even underwater reefs. Some vacationers are planning ecotours of fragile, generally pristine and relatively undisturbed natural areas. Many are planning trips to see and photograph wildlife in their native habitat in hot spots like the Galapagos archipelago off Ecuador, South Africa’s Kruger National Park, the great parks of Tanzania and Kenya, as well as Svalbard and Greenland in the Arctic and Alaska's huge Denali National Park. I've been fortunate to photograph in many of those locations, including a sensational photographic excursion in the Arctic. 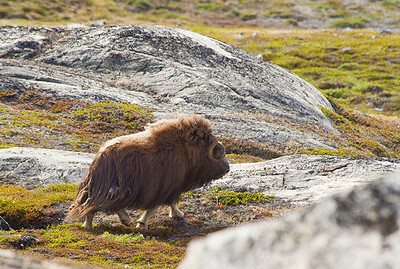 I viewed polar bears trekking across the ice, walruses, muskox, like the one pictured above. and even blue and humpback whales. Trips to see and photograph wildlife can be dangerous at times. When hiking in the Svalbard archipelago, while off our ship, we often needed well-armed sharpshooters to guard our safety. The potential danger of unexpected encounters with polar bears is a constant fear in the region. Whenever on a trip to see wildlife, safety must be the first consideration, even when the animals you’re viewing seem benign in their native habitat. In 2012, in Denali National Park, a hiker walking along the Toklat River came within 50 yards of a grizzly bear. Rather than immediately walk on, safely separating himself from the grizzly by the required 300 yards, he began photographing the grizzly. Investigators who recovered the hiker's camera said its images initially showed the bear grazing, not acting aggressively in any way. The camera showed the hiker remained there, shooting photos for eight minutes, until the grizzly attacked, mauled and killed him. Had he removed himself to a safe distance of 300 yards he'd likely be alive today to tell us of his encounter. I’ve traveled to see and photograph wildlife for decades. Here are my six basic tips to stay safe while enjoying breathtaking scenes of magnificent landscapes and seascapes with their amazing wildlife. • Research the locations — Do this before leaving home. The rainforests in Costa Rica, the African savannah, and the fjords of Greenland are obviously very different. Learn about the terrain you'll visit and their dangers and difficulties. As a photographer, that research will doubly pay off by helping to choose the right photo equipment for the trip. The “circle of fear” is an area surrounding an animal which forms its alert zone. As we approach animals they typically watch us, and use their other senses, such as smell, to surveil us. As we get closer, the animal’s fear and stress level increases, sometimes rapidly. Eventually, they will become more and more afraid and/or aggressive. The action they take can be highly unpredictable. Some will run/fly off, while others will attack. The size of an animal’s “circle of fear” is variable and depends on the animal’s attitude and state of being at each moment. • Use a highly qualified local guide — The guide at a destination should provide whatever is necessary for safety, including guards, proper vehicles, equipment, etc. They should know when and if the locale is too dangerous to visit or if circumstances change to make it dangerous while on-site. They are likely the best people to know precisely where to go in an area to see the most and stay safe. When out with a guide, listen carefully and follow their directions precisely. It could be lifesaving. • Be aware of the weather — Jungles can be very tough when it rains. Flooding rivers and streams make paths and roads impassible. Deserts can be extremely dangerous in sandstorms. Plains areas can be dangerous during unexpected storms which could cause flash floods. Be prepared and wear the right clothing. • Pay attention to surroundings while watching animals — Never get too close to an animal in the wild. If their demeanor changes while you approach them, you're too close. Never touch or feed a wild animal. Grizzly bears in Denali are dangerous and travelers/hikers need to be cautious. Moose in Maine are unpredictable. Picking up a cute black bear cub in Arkansas can be a death sentence. Polar bears in the Svalbard archipelago can be highly aggressive. TIP: Photographers have been known to get so wrapped up in their wildlife photography and have such tunnel vision, as they view the animal through their viewfinder, that they rapidly lose any perception of their distance to the animal, quickly getting themselves into trouble. Don’t let that happen to you. • Avoid young animals — Animals that are typically safe can become a nightmare if they think you’re endangering their young. If discovering cubs, immediately walk away. Never pick them up. With a “safety first” mantra you can avoid dangerous encounters with wild animals, make marvelous images of all kinds of wildlife when traveling, and get home to show them off.